On Tuesday, the much-anticipated women's team final in Olympic gymnastics ended the way we all expected. The American team, led by captain Aly Raisman and young superstar Simone Biles, took home the gold. 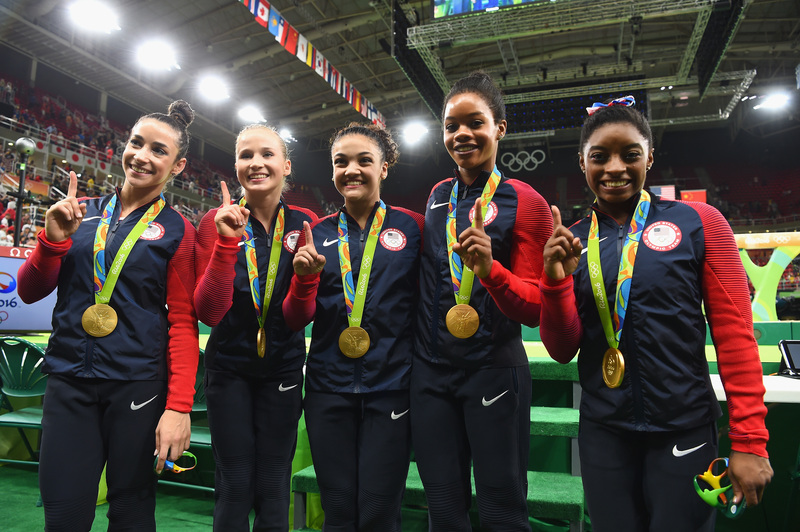 But beyond the gold medals they received atop the Olympic podium, the self-proclaimed Final Five shattered the gymnastics team scoring record by more than eight points. The Americans entered Tuesday's team final event as the clear favorites. After all, Raisman and teammate Gabby Douglas already had gold medals from the team event in London four years ago, and Biles had already become the most medaled female gymnast in world championship history. There didn't seem to be many records left to shatter, but the American team found one: the overall team score margin. The Americans won Tuesday's competition with a total score, counting all four events, of 184.897. The Russian team placed second with a score of 176.688, followed by China, which scored a total of 176.003 points. All in all, the American team edged out the competition by a margin of 8.209 points. As NBC reported shortly after the medals were awarded on Tuesday, that's the widest margin since the current scoring system was adopted 10 years ago. Before that new scoring system, gymnasts sought to attain a "perfect 10" on each element. In 1976, Nadia Comaneci of Romania became the first Olympian to score a perfect 10. The score was awarded on a scoreboard that wasn't even capable of displaying that number. Then, in 2006, the governing body of Olympic gymnastics replaced the 10-point system with a new, more complicated system that's based on a routine's difficulty and the performance of each skill and transition included in the routine. The new, more complicated system is the one that the Americans dominated on Tuesday to win gold. As they won, they announced their chosen team name: the Final Five. It's a fitting tribute to the team's coach and its sport. Famed U.S. head coach Marta Karolyi will retire after the Rio Olympics, leaving this year's team as her final Olympic squad. What's more, future Summer Olympics will feature teams of just four gymnasts, rather than five. No matter why they selected their team name, the Final Five have also become something of a First Five. They're not the first American team to win gold in their sport, but they are the first to win by such a wide margin. The best part? They're not done yet. The individual all-around and event competitions are still to come.